When considering integration of single-use technologies (SUTs or disposables) into a manufacturing process and facility, a number of criteria should be satisfied. These criteria govern both selection and implementation. Each criterion should be established by due diligence in which end-user requirements and the operation setting are considered carefully. Depending on a facility’s infrastructure and even a company’s business model, end users will define their criteria differently. Companies are driven to single-use technologies because of the simplicity and flexibility they impart to processes. But those are relative terms and depend on end-user requirements for proper interpretation. Simplicity is not an inherent characteristic of SUTs alone. At a contract manufacturer providing parenteral fill–finish services, end users (e.g., process engineers charged with technology transfer) must acknowledge that typically no appreciable amount of time will be allowed to design and subsequently optimize or develop a process through multiple development/engineering runs. Most clients entering contract agreements with such service providers bring with them aggressive timelines for supplying finished product for clinical trials. So process engineers place heavier emphasis on choosing SUTs that impart lexibility — even if that flexibility comes at the expense of elegance (e.g., quick-connect rather than irreversible connectors that all but eliminate the effects of operator technique, such as Pall Kleenpak or BioQuate connectors). Other times, the project scope for a given technology transfer allows for ample process development. Such projects often allow their process engineers time to integrate more specialized technologies wherever value is added. New technologies may require new validation activities to support their use. Although validating an SUT is not necessarily a simple endeavor, the end result of time and effort spent can be a much more robust and flexible process design with built-in ease of execution. Contract manufacturers might look to integrate SUTs recognized as widely applicable (e.g., biobags, silicone tubing, and quick connects) as part of standard media fills and thus validate their use as part of routine operations. 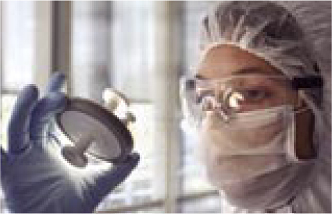 Media fills form the backbone of a fill–finish contractor’s qualified aseptic operations. Aseptic process and material flows that fall outside their prevue require additional validation to support their use. So if a new SUT is sought after by a process engineer or client for a given process, the time and effort spent validating its use should be justified. Clearly factors such as flexibility, ease of use, and effectiveness must be taken into consideration during the beginning stages of process design and technology transfer. To perform such assessment effectively, a process engineer also considers the business model within which he or she operates to best define end-user requirements. For example, at Hyaluron Contract Manufacturing (HCM), we work with clients from all stages of drug registration: preclinical, clinical, and commercial. The further along a client resides in development toward obtaining market approval, typically the more difficult it is to incorporate new technologies into the manufacturing process. Also, at a multiproduct facility such as ours that often does not have the luxury of running multiple demonstration or engineering runs before GMP production, flexibility is often tantamount. Thus simplicity is defined not only by the ease with which a device or component can be operated but also by the ease with which it can be sourced, customized, scaled up, and perhaps validated. During the initial selection process companies typically rely heavily on vendors for product information. Vendors and product managers supply much useful information in their efforts to profile their products and describe their application in the industry. Potential end users must then consider their own facility infrastructure, process flows, quality requirements, and even business environment to determine whether a particular SUT is right for them. A seemingly “simple” product may in fact be simple to use/operate but very difficult to implement. At multiproduct facilities, heavy reliance is placed on disposable technologies that best support the many different processes that must be transferred in. The technology transfer process takes on varying degrees of complexity mostly founded on the basic principal of formulation, filter, and fill–finish, whereby API and excipients are compounded and pooled into a mixing vessel, sterile filtered, and ultimately aseptically filled into vials or syringes. Formulation is typically the most variable part of that process and can involve anything from specialized complex equipment such as microfluidizers and large ultrafiltration/diafiltration skids to simple media bottles using a magnetic stir bar. SUTs are often touted for their ability to impart simplicity and flexibility to a given process, and such claims are well founded. Another appealing characteristic is per-unit operation cost, especially when compared with that associated with reusable or fixed technologies that often incur a significant initial capital investment followed by costly overhead associated with cleaning validation as well as routine cleaning, assembly, and preventative maintenance. However, to best take advantage of these appealing characteristics, some consideration must be given to the initial capital investment associated with the fixed devices and equipment that support different types of disposable technologies. To support easy integration of completely disposable systems at HCM, investment has been made into fixed equipment such as the LevTech superconducting magnetic drive unit from Sartorius Stedim Biotech. The magnetic drive unit supports the use of LevTech mixing bags (Figure 1), which are three-dimensional disposable biobags that incorporate a high-density polyethylene (HDPE) mixing impeller with a magnetic core. Because the impeller is driven by a magnetic field, there is no mechanical coupling, which eliminates concern for particle shedding within. There’s nothing seemingly “simplistic” about such a device, but once it is integrated into a facility and operators have been trained how to operate it, tech transfers can be streamlined and thus easy to manage. r aspects of HCM’s business were taken into account as well, such as the fact that most clients come to us with processes that will eventually need scaling up. LevTech supports the entire range of batch sizes we typically see and therefore serves as an excellent scaled-down model whereby the same equipment and similar aspect ratios with similar fluid dynamics can be used when processing different volumes. This is appealing when clients want to perform demo or engineering runs at some fraction of full scale and are looking to mitigate compromises that could bring to their actual processes and equipment. 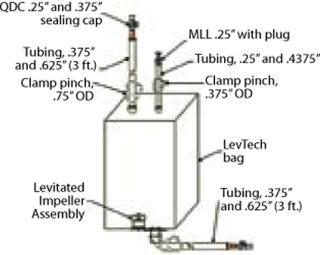 If dissolution time is a critical factor, and the engineering run is being performed at 10 L (compared with a full-scale 100 L), data generated from a smaller LevTech tank with similar aspect ratios and equipment to the full scale are likely to be more robust than if a polypropylene 10-L carboy and overhead mixer were used as the scaled-down model. So in that example, it already appears that all end-user requirements have been met. But to ensure that a single-use solution fully meets these requirements, we must take into account several other factors at HCM: chemical compatibility, customization possibilities, validation implications, sterility, containment, assembly options, and filtration. Chemical Compatibility: For most aqueous formulations, the polymers that make up SUT product-contact surfaces (e.g., low- and high-density polyethylene, silicone, polypropylene, polycarbonate, and so on) have an acceptable compatibility profile. However organic solvents can make chemical compatibility an issue, causing end users to abandon traditional disposable technologies altogether and choose traditional glass or stainless steel options. Emerging SUTs such as Kynar (polyvinylidene fluoride, PVDF) bags may offer a disposable option for accommodating formulations based on organic solvents. But glass can be a nice “semidisposable” option (e.g., Bellco vessels) because it can be thrown away after use; in most cases, however, glass vessels must be cleaned and sterilized before use, unlike most off-the-shelf disposables. When investigating whether or not a particular material is chemically compatible, be sure to consider residence time (how long a bulk formulation will remain in contact with the material in question). For example, although a particular chemical compatibility chart may list silicone as mildly incompatible with fatty acids, you might find that there is no real issue given the process times associated with fluid transfer through silicone tubing. Often this is considered “incidental” contact and found to be perfectly acceptable after running a hold-time study as well as leachables testing. When determining whether or not a particular disposable filter is compatible with a given formulation, be sure to consider not only the filter membrane itself, but also the filter housings. Those are often made of either polypropylene or polycarbonate. Customization: Many disposable technologies lend themselves greatly to customization. 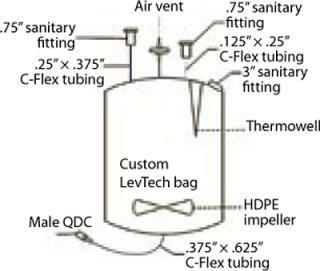 At HCM, we’ve taken advantage of custom design options for LevTech bags (Figure 2) to support challenging formulation characteristics such as oxygen sensitivity, temperature monitoring and control, small-volume in-process sampling, containment, recirculation, in-line sterile filtration, and photosensitivity. Implications for Validation: If SUT is used to support aseptic processing or as part of a critical process parameter, then project scope will probably need to provide for some level of validation — unless the item is so widely applicable that its use is already incorporated into a company’s media fills (as with a fill–finish contractor). Both client and end-user need to determine if it’s worth the time and investment to validate. Consider tubing welders for aseptic connections. They require initial capital investment followed by validation. After that, however, an enormous amount of flexibility is imparted to later processes. At HCM, a tubing welder has such wide applicability to so many different processes, a decision was made to invest in weldable tubing technology as a device that supports the use of disposable tubing. Such a decision makes sense for the type of services offered by our company. Sterile or Nonsterile Application? If bulk product is sterile, then a closed system must often be used. Closed systems present challenges for aseptic sampling and component addition. Such manipulations make it possible to compromise the aseptic integrity of a system. Disposable vessels can be customized and prefabricated with aseptic connectors and sampling devices to address this issue. When closed systems are not necessary to maintain sterility or provide containment of potent/toxic compounds, then disposable “open” systems are often implemented. When using a 3D mixing bag such as the LevTech brand, nonsterile applications may allow use of an open liner instead of a closed bag, thus providing for easy access to bulk product for in-process sampling as well as component addition and/or pH adjustment. Containment: If handling cytotoxic or potent compounds consider using disposable glove boxes. A disposable glove bag may be considered a simple and inexpensive option; however, these are cumbersome to use and ineffective if not used properly. For a slightly greater investment, disposable vinyl glove boxes (e.g., from Coy Labs) are much easier to use and extremely effective for handling powders. They allow for closed-circuit fluid transfer directly from glove box to receiving vessel. HyClone Powdertainer bags are a great disposable option for filling and transporting powders. Each is fitted with a three-inch sanitary fitting that can directly articulate with another such fitting incorporated into a receiving vessel. Component Preparation or Preassembled? An appealing aspect of SUTs is the ability to combine different disposable products together to form assemblies or process trains. This can be very convenient and mitigate risks that would otherwise be brought on by relying on operators to properly assemble (and often sterilize) the components. Be aware, however, that the more complex a preassembly is, the less flexible it will be. Filtration: Completely disposable capsule filters are available, as are excellent disposable options for tangential-flow filtration. Until fairly recently, cross-flow cassettes were disposable, but their holders were made of reusable stainless steel. Now even those holders come disposable in disposable plastic sandwiched within a large stainless unit so that all product-contact surfaces are completely disposable. Clearly the biopharmaceutical industry has available several widely accepted single-use technologies. No longer is there a need to convince end-users of the value added through integration of disposables both in cost/scope control and simplicity/flexibility of process. It’s no longer a question of “Should we use disposables?” as it is of “Which should we use?” and “How do we implement them?” End-users need to be aware of not only which technologies are available for a given application, but also how to best go about determining which technologies are truly the best option for both the application itself and the business environment within which it is being used. These days, we find that not only are there emerging technologies to identify and evaluate, but also more variations on the same themes. Not too long ago, there was only one aseptic tubing welder on the market (from Terumo), and now there are half a dozen or so. Wave Biotech put out the first wave-based reactor/mixer quite a few years ago. Today there are many variations on that theme, each with its own subtle differences. The advantages and disadvantages of one product over another are not always obvious. So the challenge for end users is to determine first what potential solutions are offered and then to determine which best suits a particular situation. They must rely on vendors, product managers, and the experience of their peers to hone in on the right choice. To do that successfully, end users will also have to carefully consider their own requirements carefully.